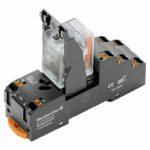 Our relay KITs are particularly convenient to use. They are completely assembled and 100% function-tested. Overall, they save time during installation. Each set has an article number for ordering, thus reducing storage requirements. Relay modules are used for insulation and switching amplification in various industrial areas and applications. 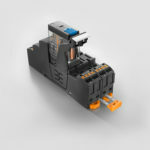 With up to 28 connection points per socket, they have a considerable influence on the wiring time during installation. 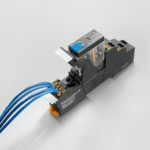 The choice of socket connection technology is decisive for optimal, fast installation. The PUSH IN sockets of the D-SERIES significantly reduce the wiringtime. An integrated cross-connect option allows the sockets to be connected to each other via jumpers. 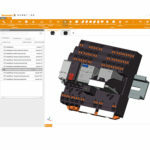 Each connection has an additional test tap, which significantly simplifies maintenance work. 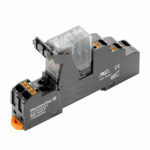 Our relay KITs are particularly convenient to use. They are completely assembled and 100 % functiontested. Overall, they save time during installation. Each set has an article number for ordering, which reduces the storage you need. The PUSH IN connection speeds up the wiring. The integrated test point facilitates troubleshooting during operation. Jumpers enable daisy chaining of the A2 ports. 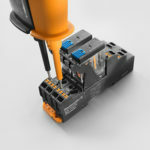 The marker on the retaining clip provides optimal visibility and precise identification, even when wires are connected. The product family D-SERIES is completely integrated in the Weidmueller Configurator. This makes efficient planning and correct combination of plug-in relays with its accessories easier. 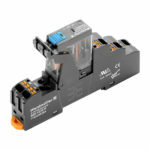 Weidmüller – Your partner in Industrial Connectivity As experienced experts we support our customers and partners around the world with products, solutions and services in the industrial environment of power, signal and data. We are at home in their industries and markets and know the technological challenges of tomorrow. We are therefore continuously developing innovative, sustainable and useful solutions for their individual needs. Together we set standards in Industrial Connectivity.